This spring, establish a better foundation for workplace safety by making sure to follow these simple steps. The easiest way to maintain a happy, healthy workplace is to do whatever you can to keep a safe work environment. This spring, establish a better foundation for workplace safety by making sure to follow these simple steps. Rules exist for a reason, so if a task requires safety equipment, such as earplugs, hard hats, safety goggles or gloves, make sure to use them. These significantly lower your risk of injury. Likewise, make sure that employees are sober at all times. Approximately 3% of all workplace fatalities yearly are due to use of drugs or alcohol on the job. This spring, give your employees a safety regulation refresher course to help prevent any infractions of these protocols. Regardless of your profession, good posture can make a huge difference in your long-term health and comfort on the job. This is particularly important when lifting. Always make sure to team lift and use mechanical aids when possible. If you have access to a wheelbarrow, dolly, crank or forklift, then use it. While it may add a minute or two, saving your back and muscles will pay off in the long run. That said, always be sure that machines and tools are being used properly. Don’t use tools for unrelated purposes. Always be aware of your surroundings. If you see something, say something. Any potential hazards must be reported to a supervisor immediately. If an unsafe condition occurs, employers are legally obligated to ensure that it is taken care of effectively before anyone gets hurt. You might want to plop a pallet in front of the fire door for a moment, but if disaster strikes, that can make a difference in a life and death situation. Emergency exits must stay clear at all times for reasons of workplace safety. Emergency shut offs for equipment should also be kept clear and easily accessible. Regular breaks and stress maintenance are both necessary to ensure that you and your staff are operating with clear, focused minds. Long hours, job insecurity, heavy workloads, and workplace conflicts can all cause a buildup of stress that leads to distraction and depression. 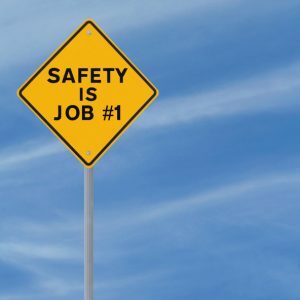 It’s important to address these workplace safety concerns to ensure a happy, healthy workplace. This entry was posted on Friday, April 6th, 2018	at 3:47 pm	. Both comments and pings are currently closed.